During the hot summer months, it is always nice to use kitchen gadgets for cooking and baking that cut down on the heat. One great way to keep the house cooler is by using the Instant Pot. I use my Instant Pot every single day and it is one of my favorite kitchen appliances! Not only does it produce less heat than the oven, but it also cuts down on cook time. So, if you forget to thaw meat for supper, just throw it in the Instant Pot a couple of hours before dinner and you’ll be saved from ‘having’ to order take-out. However, sometimes you don’t want to use any heat at all. At least, not in the house. So, fire up the grill and make some protein and use one of these delicious frugal cold side dishes to complete your summer meal! I love fresh cabbage a variety of ways. It adds a crunch to tacos, it is delicious in wraps, and cabbage salads of all kinds are so good. Cabbage is super frugal and it’s healthy, too. My favorite way to eat shredded cabbage is with a homemade coleslaw dressing. I add frozen peas and chopped green onions for a beautiful green salad. It is Trim Healthy Mama friendly, too. I mix up mayo and raw apple cider vinegar (or lemon juice) in a gallon Ziploc bag, add some Truvia, salt, and pepper. Seal the bag and press to mix. Then I add the chopped/shredded cabbage, frozen green peas, and chopped green onion. Seal, shake, and squeeze to mix well. Then place in the fridge for a few hours to let the flavors blend and the peas thaw. So good! Other delicious add-in options are chopped cheese (blue cheese crumbles are yummy), chopped ham or bacon, and chopped hard-boiled egg. 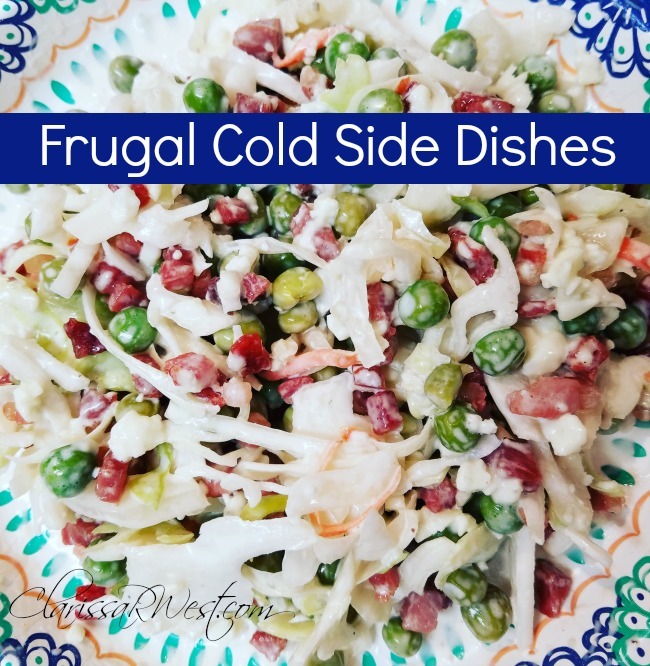 Below are several cabbage salad recipes from around the web for easy no-heat side dishes for summer! I can’t seem to get to your Facebook Group, Domestically Challenged, Divinely Equipped. It tells me that “the content is not available”. I think I already may have joined the group before, but I am not sure. Can you help me please? Would love to be able to get this for another entry to this awesome giveaway. One of my many things on my wish list is a Instant Pot!! That link doesn’t seem to work either. Sorry. Ok, I’m not sure why it doesn’t work. That is the direct link. Try again after awhile, and I’ll keep looking into it on my end. I apologize for the issue.